So... on Monday I got to be in downtown Toronto (still kinda spooked by what happened that day in another part of the city) and I got to experience the new LG G7 (I'm personally refusing to add the ThinQ ... just ... blerch). I can't tell you much about that session ... yet ... but what I can tell you, because they released a media release is about a new feature called "Boosted Brightness". Now, the neat thing here is that you can crank up your brightness on the LCD display (and apparently it's a WHITE-RGB display... I'm sure more info will come out later) and it looks good. Then tap the little sun icon for brightness and it becomes 'boosted' and then it magically jumps to 1000 nits (typical phones run about 600 or so). Very cool. TORONTO, Apr. 25, 2018 — The upcoming premium smartphone from LG Electronics (LG) will feature a new 6.1-inch QHD+ (3120 x 1440 resolution) FullVision display capable of a maximum brightness of 1,000 nit, making it the brightest and most vibrant display on the smartphone market today. Powered by LG’s latest Super Bright Display technology, the LG G7ThinQ is designed for ease-of-use in bright sunlight while reducing power consumption by as much as 30 percent compared to its predecessor. With Super Bright Display, colour tones on the LG G7ThinQ appear rich and natural even under bright lighting. Covering 100 percent of DCI-P3 colour space, the LG G7ThinQ can automatically adapt to six colour settings – Auto, Eco, Cinema, Sports, Game and Expert. Auto mode automatically analyzes and identifies the content as video, photo, game or website and optimizes the display setting for the best viewing experience while also reducing power usage. For power users looking for more control, the LG G7ThinQ took a page out of the camera user interface to give users the ability to fine-tune colours with a scroll wheel for each RGB setting. Improving on the already superb display-to-body ratio of the LG G6, the seventh generation G series from LG will be extremely easy to use and comfortable to hold in one hand thanks to the ergonomic and gorgeous curved tempered glass. 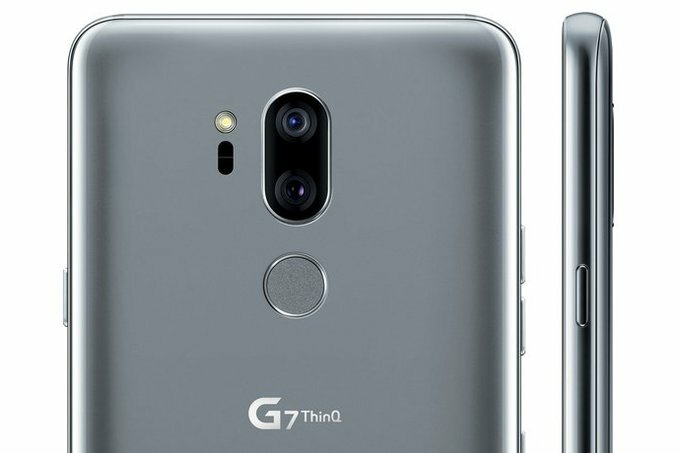 The trend-setting 18:9 FullVision display first announced last year has been improved for the LG G7ThinQ. Sporting a slimmer ratio of 19.5:9, LG’s new FullVision display is complemented by a nearly 50 percent slimmer bottom bezel compared to the LG G6. The bezel-less design of the FullVision display provides a more immersive viewing experience while the New Second Screen variable display creates additional room at the top of the screen for notifications without taking up prime screen real estate. The New Second Screen can be de-activated for a more traditional look or set to display different colours for a totally unique user experience.